Dinner, anyone? Star chef Morimoto eats his way through the Open’s food court. The sushi double faulted, but the corned beef was an ace. WATCH VIDEO and more in Hungry Beast. I attend baseball games when I get the chance, but Monday was a treat: my first time attending the U.S. Open. I quickly became a fan of 17-year-old Melanie Oudin and watched Roger Federer show why he’s No. 1 in the world. But my real mandate from The Daily Beast was to sample the food. I had been told that the U.S. Open offers wide-ranging and upscale offerings. Sushi was a particular interest, of course. There were two sushi booths in the National Tennis Center: One was at the food pavilion and the other was in the stadium. Neither looked like a sushi place. Make it attractive if you want to call it “sushi.” As a sushi chef, I was pretty disappointed. Their menu didn’t have many interesting choices, either. I tasted the California roll ($9.50) and spicy tuna roll ($10) in the pavilion. The sushi rice wasn’t seasoned enough, and was pressed too hard. Since both of them were inside-out rolls, they should sprinkle sesame seeds outside to make them taste better. I cannot really rate the quality of fish because I tasted only tuna. It was OK. The prices were high: As with any sporting venue, food is very expensive even when quality isn’t. New Yorkers are used to eating high-quality sushi, so they should do better here. In fact, I didn’t see any customers at the sushi place while other vendors had lines of customers. Before opening Morimoto in New York CIty, I opened it in Philadelphia, and thus know my cheesesteaks. The U.S. Open version ($9) at the pavilion was not close to the ones in Philly. Down there, they know the meat must stay moist because it’s thinly cut; the beef here was too dry and lacked sufficient cheese. Those are related: More cheese would have hidden the dryness. The cheese was American: In Philly, purists use Cheez Whiz or provolone. Plus, there were no toppings. Not even onions. New Yorkers are used to eating high-quality sushi, so they should do better here. In fact, I didn’t see any customers at the sushi place while other vendors had lines of customers. Carnegie Deli’s corned-beef sandwich ($13) was better. I think it was the same as the one served at its restaurant. It was the best thing I tasted, maybe because the flavorful beef didn’t need any cooking on site and thus wasn’t dry. I also had a hot dog ($6) at Arthur Ashe Stadium. OK, I had two. I think I was supposed to put on ketchup and other condiments at a separate counter, but since the crowds cannot get back to their own seats while a match is in progress, I didn’t have the time to put on any toppings!! So I ate them plain. They were fine, and a nice size. The pavilion was missing my favorite beer—Morimoto Beer!—so an $8 Heineken had to suffice. I thought the plastic souvenir cup was kind of cool, so I brought it home. Leaving the National Tennis Center, I saw Citi Field on the opposite side from the subway station. I think baseball fans get better food. Next year, I will try to change that: I will make great sushi at the U.S. Open for tennis fans. 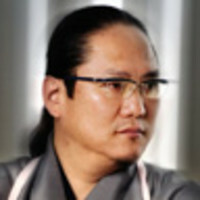 Chef Masaharu Morimoto—known to millions as star of Iron Chef and Iron Chef America —is as comfortable cooking against the clock for a live television audience as he is preparing his signature omakase menu at his wildly popular namesake restaurants in Philadelphia and New York, where through the seamless integration of Western and Japanese ingredients, Morimoto has effectively created his own unique cuisine.